Exclusive £5 Gift Card with Orders Over £100 at B&Q Pick a £5 digital gift card once your B&Q purchase has been verified! We'll email you how to claim. 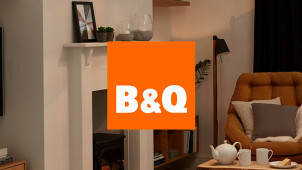 Enjoy 20% Off in the Price Drop Event at B&Q - Including Lighting, Power Tools & Furniture Discover the Price Drop Event at B&Q and save 20% on selected lines. Discover £60 Off in the Home & Garden Clearance this Spring at B&Q Shop the range and save £60 this spring at B&Q. 40% Off Selected Garden Furniture at B&Q - Including Sets, Sofas & Accessories Get Spring/Summer ready and save 40% on your new garden furniture at B&Q. Enjoy £20 Off Gardening Power Tools this Spring at B&Q Spring is here! Shop the range of gardening tools at B&Q today. 20% Off Selected Painting and Decorating at B&Q - Limited Time Get stuck into some DIY ready this spring with 20% off painting and decorating at B&Q. Free Next Day Delivery on Orders Over £50 at B&Q Spending £50 or more at B&Q? You can get free delivery on your order today. 50% Off Selected Home Furnishings at B&Q - Including Bedding, Throws & Wall Art Add those finishing touches to your home for less at B&Q. Free 1 Hour Click and Collect on Orders at B&Q Avoid delivery fees with click and collect and pick up your order as soon as an hour later at your local B&Q. Want to make your mark on your home? To add that personal touch, and to deck out your crib or turn your house into a home - B&Q is the place to be. From the foundation, structure, lighting and electricals to the furniture, storage, colours and more - it goes further than power tools, bricks and paving at B&Q. To discover a world of exciting products that'll get you on your way to homey comforts, shop B&Q with us to save on turning your new DIY dreams into a reality. For every room and product, find a rug for the bedroom or a sink for the bathroom - this is an eclectic offering of goods, all of which are top quality and great value for money. With an abundant section dedicated to the garden, your outdoor space will be well preened too. Here you have no limits; find boundless inspiration online, including How To Guides to help you get on your way to household heaven. The team at B&Q are always on hand to help you with your product choices, so you will never be alone in finding the things you need to make it all happen. How do I use my B&Q discount code? Enter your code, click ‘Add discount’ then ‘Go to checkout’ to complete the order. Become a B&Q Club Member and reap the benefits of a welcome voucher, money off when you spend, exclusive offers and much more. With different levels of membership, for even more rewards - it's never too late to join the B&Q party! When is the B&Q sale? There will be seasonal sales and clearance offers year round, make sure you stay in the know by becoming a Club Member as mentioned above! Does B&Q offer Next Day Delivery? Next Day Delivery is offered at Standard across thousands of products, simply order before 7pm and 4pm on Sundays. Where is my nearest B&Q? Use the Store Locator online to find a B&Q near you, simply pop in your postcode or town. How will I know how much to order from B&Q? When it comes to wallpaper, paving, ceiling goods and more, it can be tricky calculating how much you need of everything to cover the space or area you are working with. Thankfully B&Q has a handy array of calculators to figure out the tricky stuff for you, check them out in the Help & Advice section online. Click&Collect and Doddle services are also available. B&Q operates a 45-day returns and exchange policy on items in their original condition and returned with a receipt/order confirmation/invoice. For general enquiries call: 0333 014 3098. Write to: B&Q Customer Services, North Avenue, Clydebank, West Dunbartonshire, G81 2NT. For the professional builder, DIY enthusiast and handyman about the home - B&Q is the home improvement and garden centre for you. With thousands of products on offer, this is where you will find the tools you need and more to get the job done! With a B&Q discount code from vouchercloud, you’ll be able to put a fresh lick of paint on the walls, invest in garden furniture and much more all for less. With B&Q, you don’t have to hold back on home improvements. There is a B&Q App which will help keep you up-to-date with all of the latest news from your favourite DIY superstore. With lots of helpful tips and advice available at your fingertips too, you can get through any project with ease and you'll never be short of inspiration here! Find out more about new products and view your B&Q membership details on your phone at any time. So apart from the painting and plastering, there's not much good that this nifty app doesn't do! The Power Tools category at B&Q offers a comprehensive selection of quality and affordable tools, for when your DIYing gets serious. With drills, screwdrivers, nail guns, glue guns and more - with B&Q vouchers you'll be able to save on those essential tools from the biggest and most renowned brands in the business. Whether you're putting together a garden furniture set in time for summer or taking on a flatpack wardrobe for the bedroom, with B&Q you'll be a pro in your own home.